As promised in this previous blog, I have created a custom Database implementation for Firebird in the EntLib 2.0 framework. So you see it's really easy to implement a custom Database object for EntLib DAAB if its ADO.NET native providers exist. With this, developers can use consistent API to access the databases in an elegant way. It's especially useful when you need to access multiple databases (from different database types) in the same application. This entry was posted on 1/23/2007 02:20:00 PM . You can follow any responses to this entry through the RSS 2.0 feed. You can leave a response, or trackback from your own site. Great article - thanks. Could you post the source files? sdeepak, This blog host doesn't support posting non-image files. Send me an email (hugh.ang at gmail dot com). I will send you the zip file. Hi! Could you send to me sources? Or could you help to resolve problem - how to add provider? 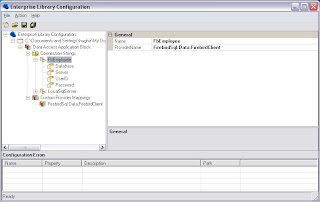 < add name="Firebird Data Provider" invariant="FirebirdSql.Data.EntLib" description=".Net Framework Data Provider for Firebird"
To the last comment, you can find the configuration in this Firebird ADO.NET Provider blog. Email me(hugh.ang at gmail dot com) if you need the source.